For the past six weeks, I have been reflecting a great deal on the remarkable life of Sylvia “Sunny” Moore and the impact that she had on my own. I learned of Sunny’s death as I was busy preparing for a 3 week trek in South America. 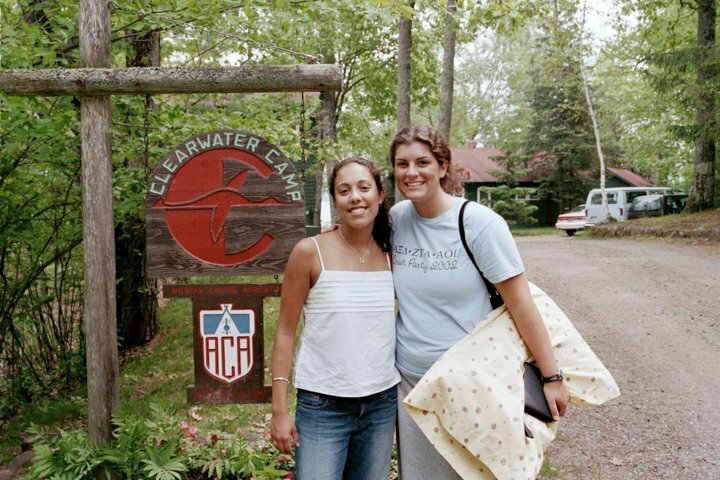 As I was folding trip scarves and placing the heavy items on the bottom of my pack I couldn’t help but reflect on my many summers at Clearwater Camp and the lasting impact that it’s had on me. The next three and a half weeks were full of firsts for me: my first time away from home, my first time sharing a cabin with five other girls, my first time shooting a bow and arrow, hiking a trail with a pack, cooking over an open fire, getting up on water skis, and, of course, my first time rolling down a hill in a barrel. That summer I first stepped into a darkroom. I auditioned for and was cast in my first play (Wizard of Oz, I played Auntie Em). I even mastered a back dive off the raft, a talent I still boast of whenever I see a diving board. My summers at Clearwater were spent not only challenging myself physically, but also nurturing friendships. Camp friends are still counted among my dearest and counselors I still, secretly, want to be just like have both helped to mature and direct my life in ways I can now recognize in hindsight. These camp sisters didn’t necessarily change who I was, they helped me to realize my potential and encouraged my talents. Sunny’s trained eye recognized traits I didn’t know were within me and helped bring them to the surface. She brought out my sense of adventure by placing me on the Canadian Boundary Waters honor trip. She encouraged my planning and organizational skills by including me in the Banquet Committee. And she nurtured my leadership capabilities by hiring me as a member of her staff and entrusting me with my own set of young, impressionable girls. Last year, a Clearwater friend sent me this Because of Camp video. It’s a montage of various celebrities giving one liners about how their experience at summer camp positively affected their lives. On the trail in South America I thought a lot about my own “because of camp” moments. Because of camp, I had the confidence and courage to first go to Africa. Because of camp, I became a photographer. Because of camp, I have respect for nature. Because of camp, I crave adventure. These statements are no small thing. My experience at Clearwater influenced not only my profession but, more importantly, my passion. Clearwater turns out extraordinary, adventurous and respectable women, and I’m honored to be counted among them. On the edge of summer we all hear that familiar call of the “far Northland” and while life and jobs and adulthood and responsibilities keep many of us from answering it, we have access to that camp vault of memories. Memories of falling asleep to the melody of halyards clanging against masts. Of silently gliding through calm water in an aluminum canoe. Of first seeing the wonder and beauty of the Northern Lights. How truly blessed we are, to have encountered all of this as children. To have spent our summers in such a magical place. To have been given the opportunity to experience new adventures and make lifelong friends. To have been known, believed in and loved by such an extraordinary woman as Sunny Moore.